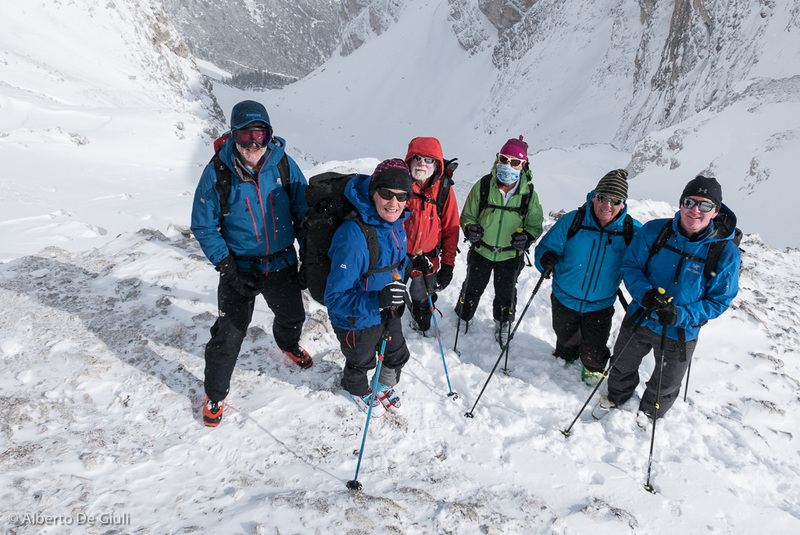 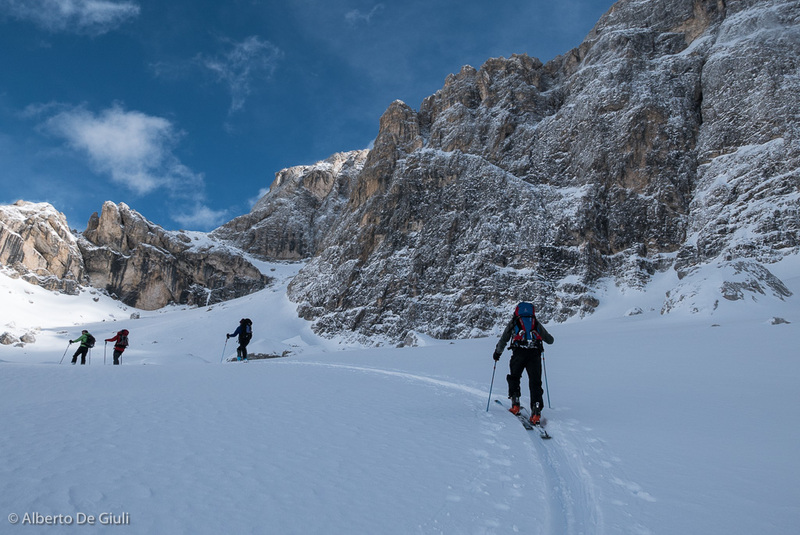 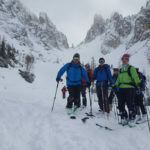 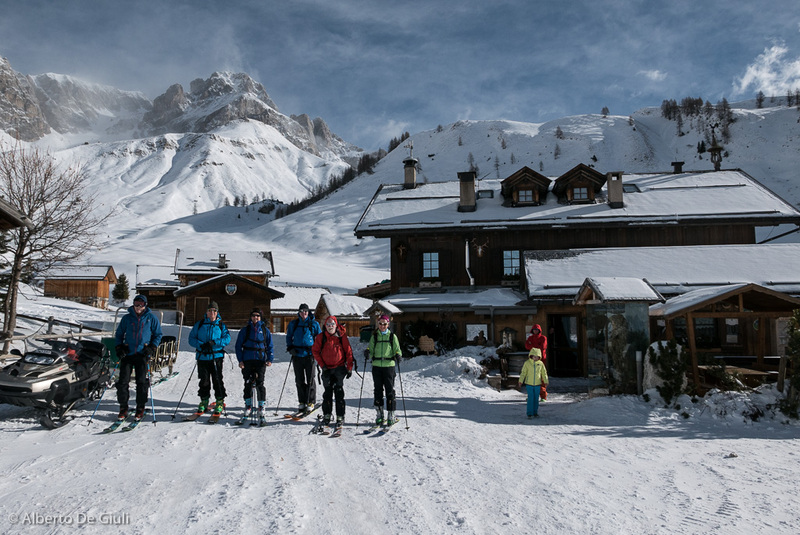 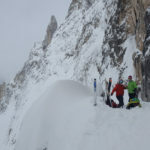 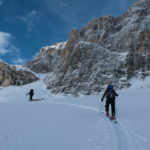 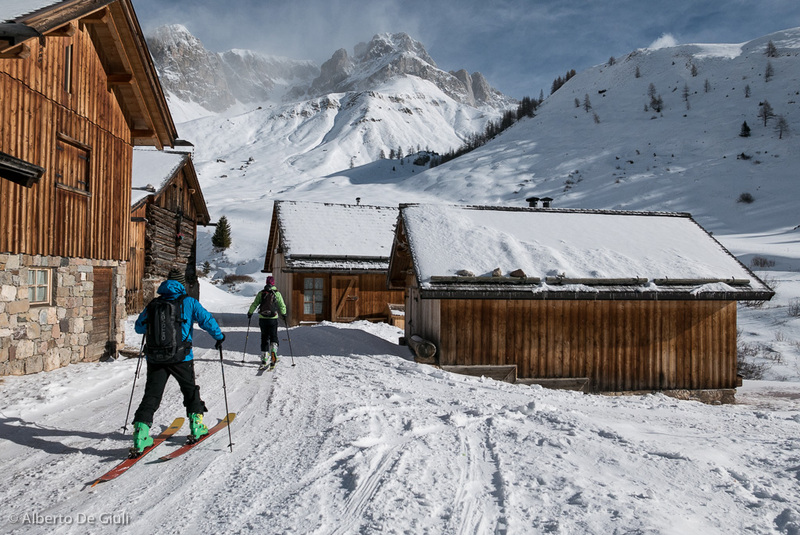 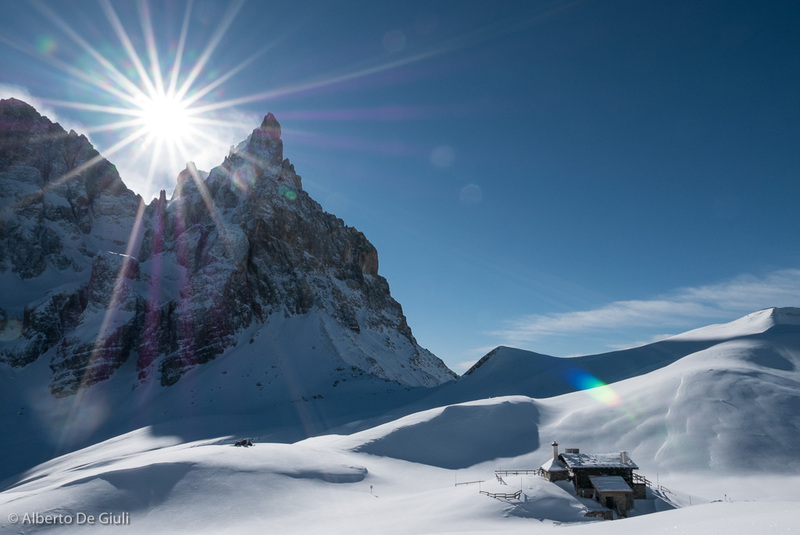 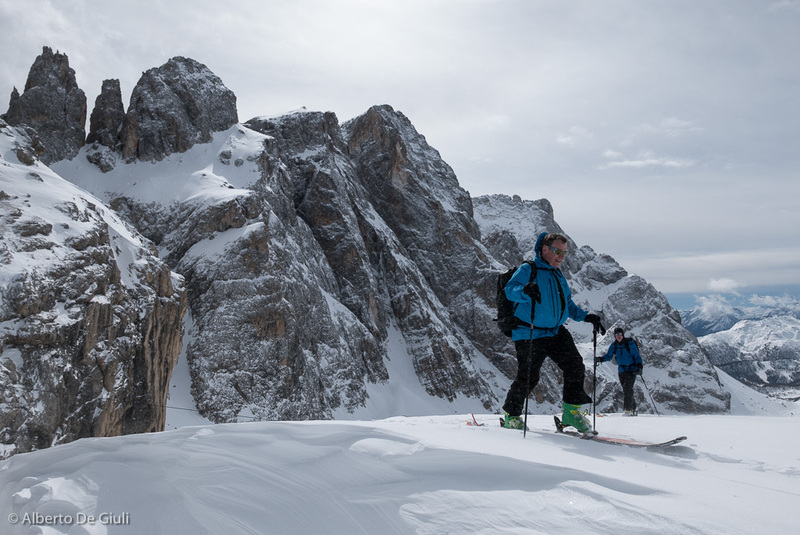 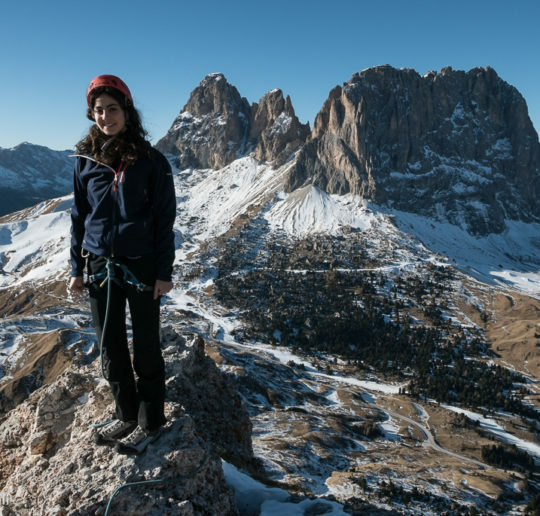 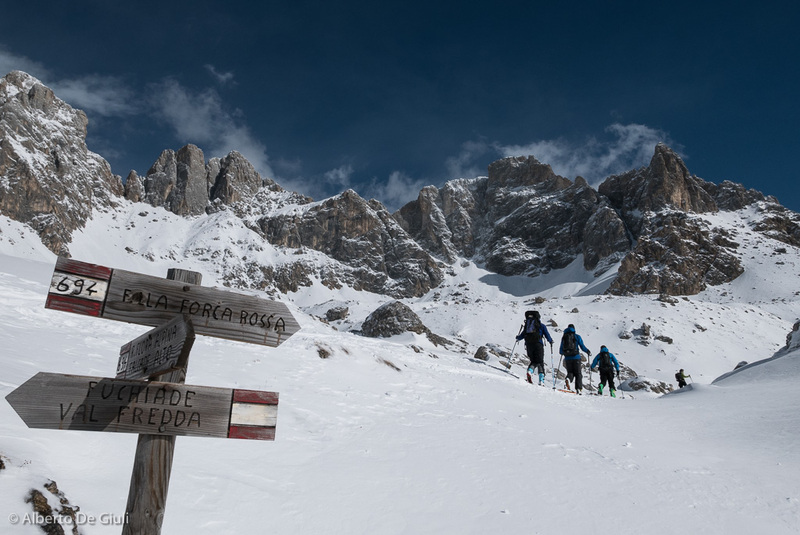 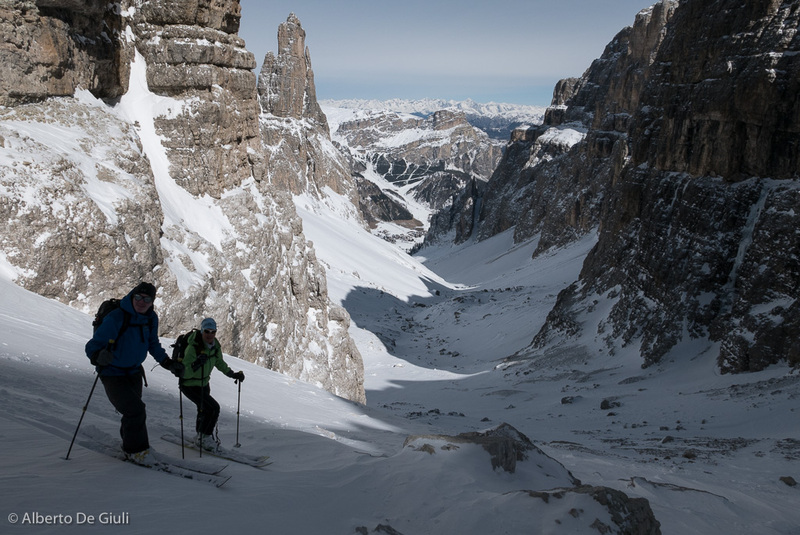 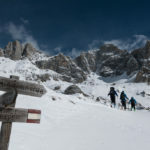 I was pretty worried about the Dolomites ski traverse from San Martino di Castrozza in Braies scheduled for late February with Ski Club of Great Britain team. 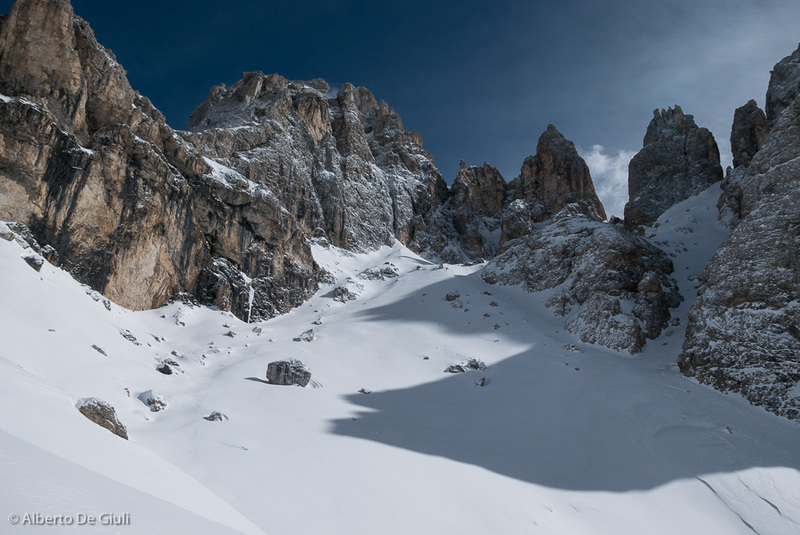 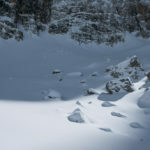 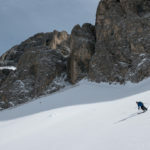 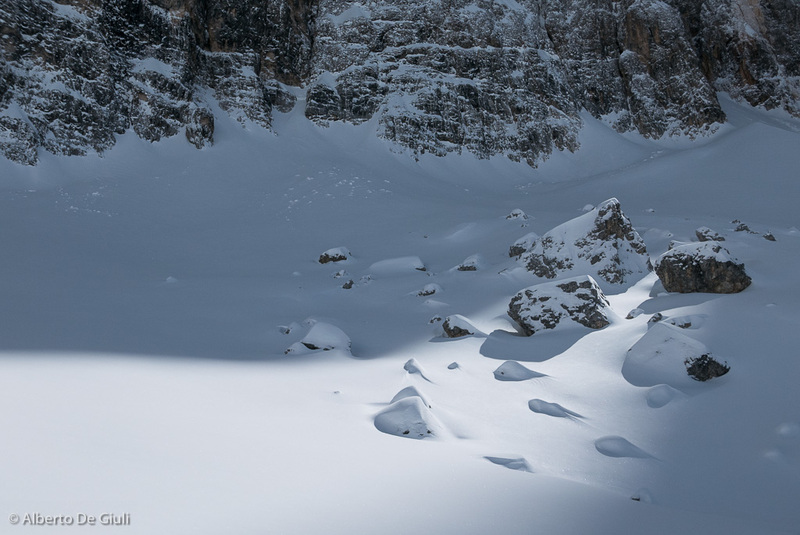 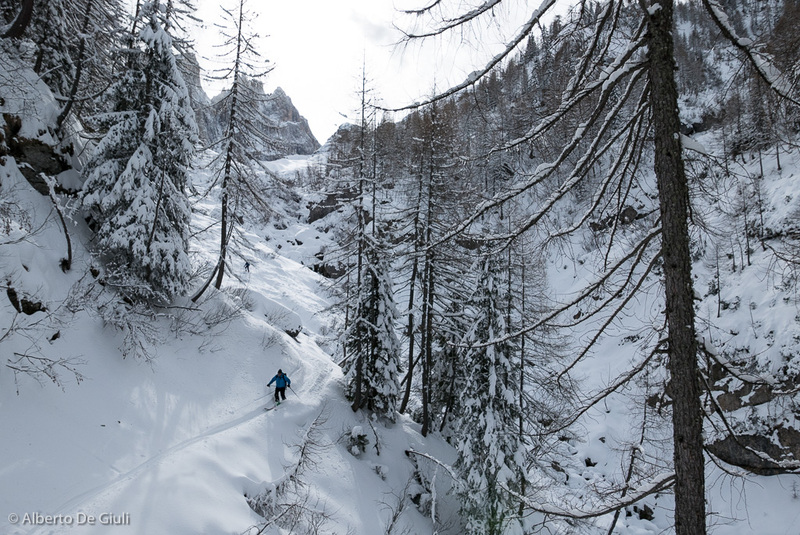 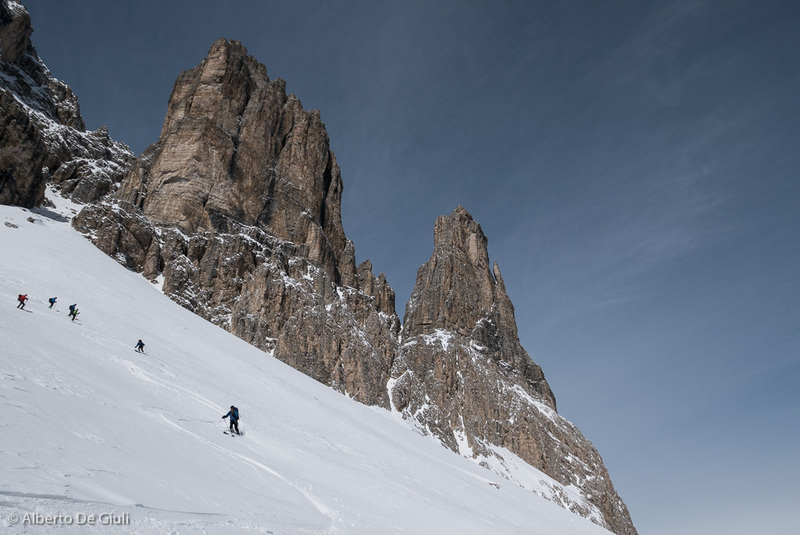 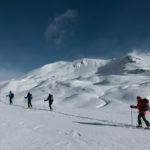 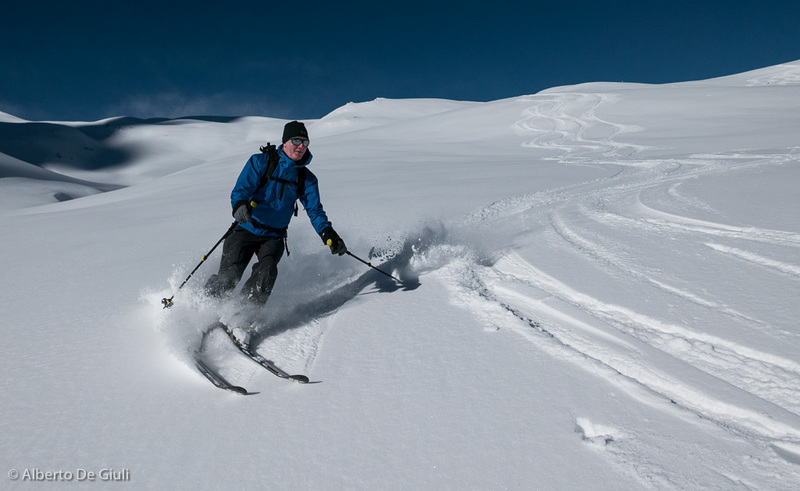 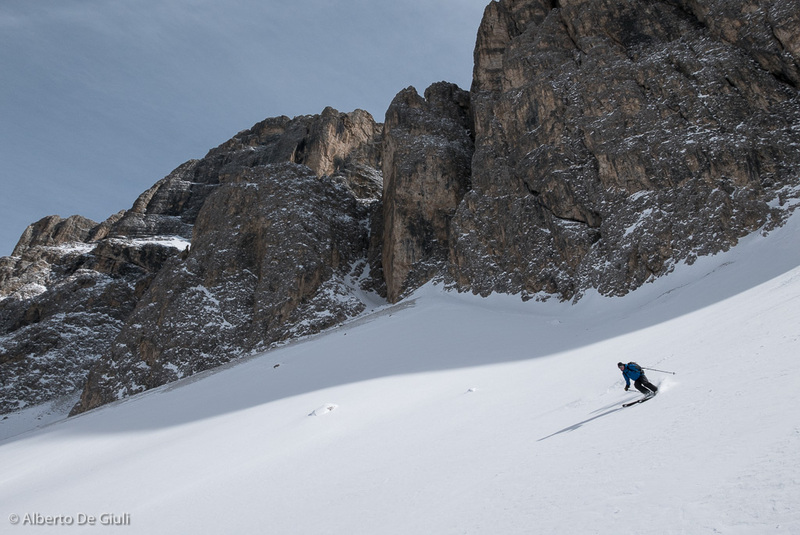 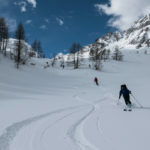 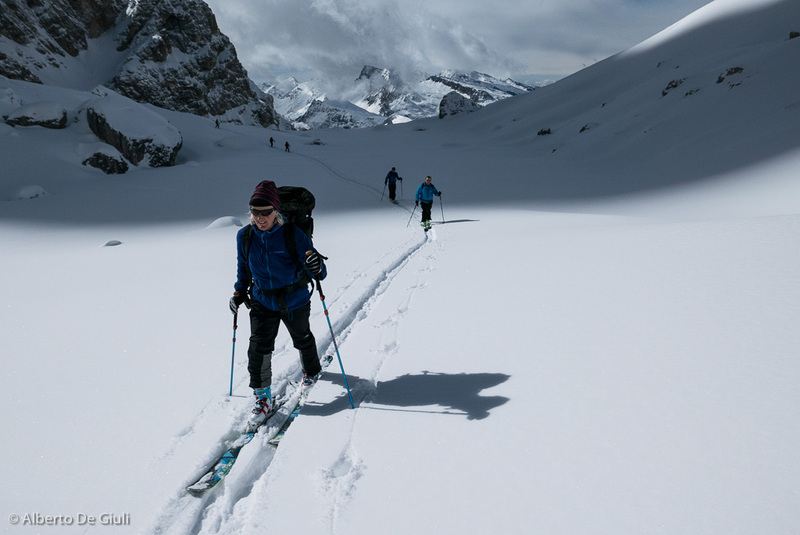 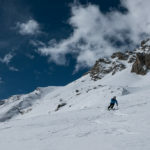 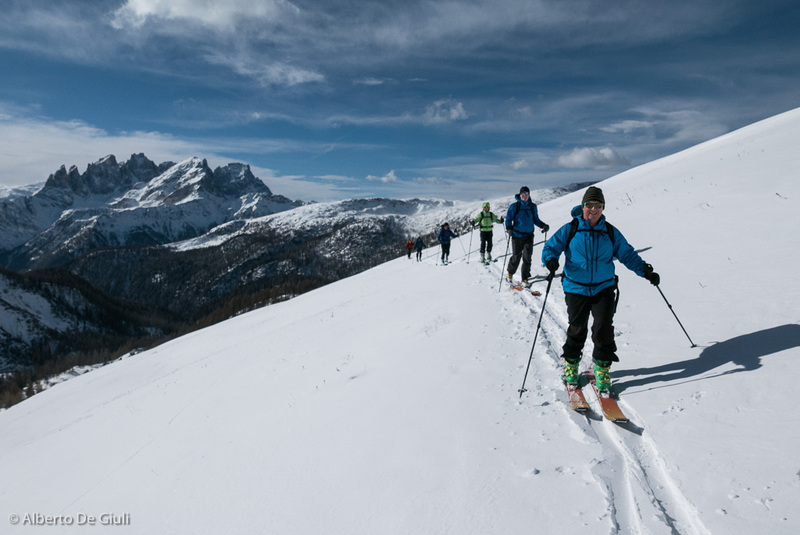 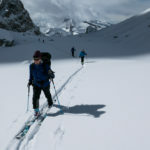 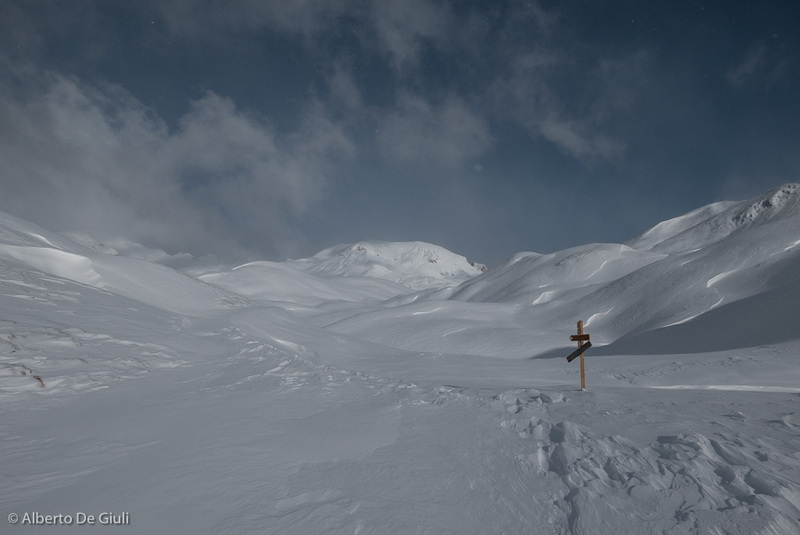 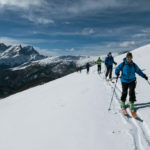 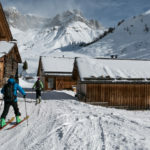 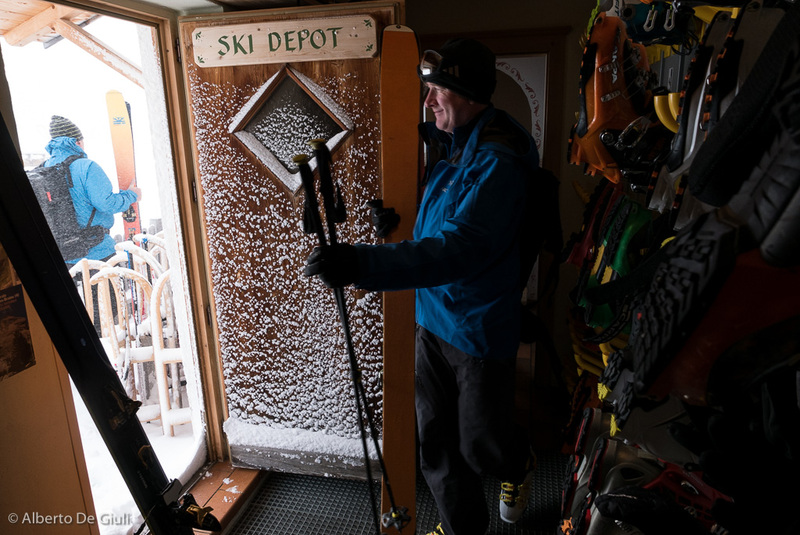 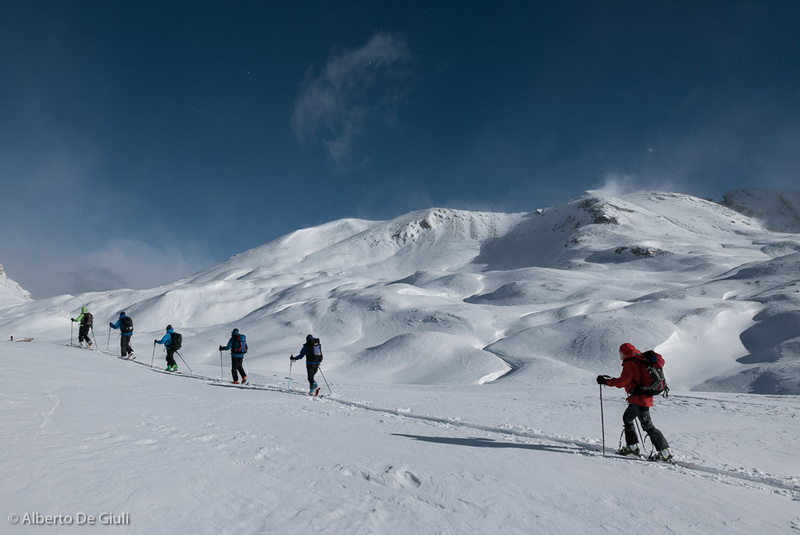 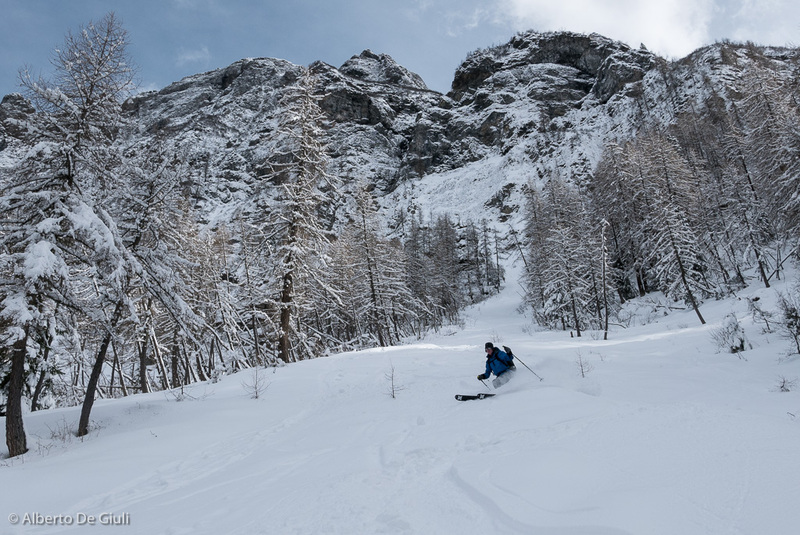 The skitour to Forcella Bachet had given me some hope, but there were still many uncertaintes about the possibility of doing a whole trip on skis outside the groomed slopes. 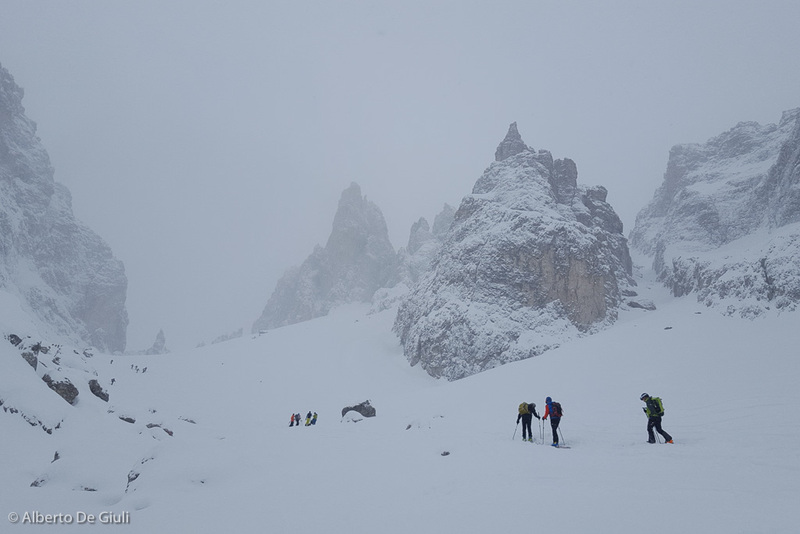 Fortunately something happened the day before the trip started, a good snow fall turned everything white again. 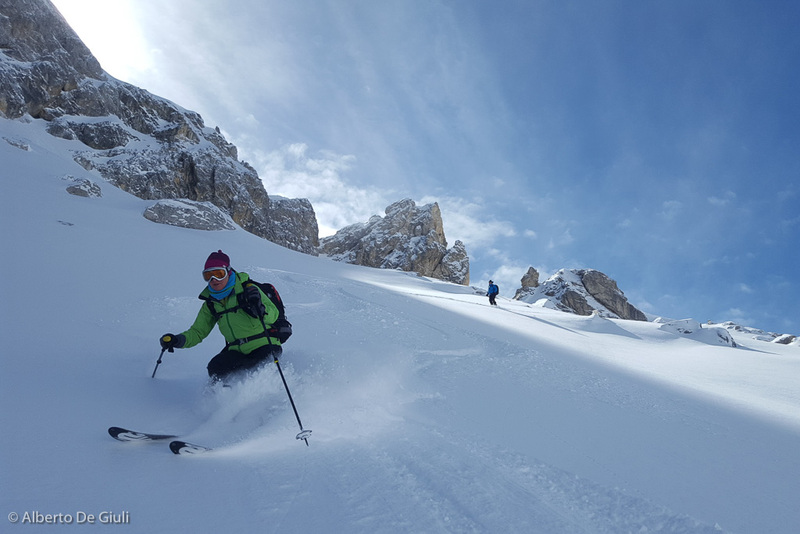 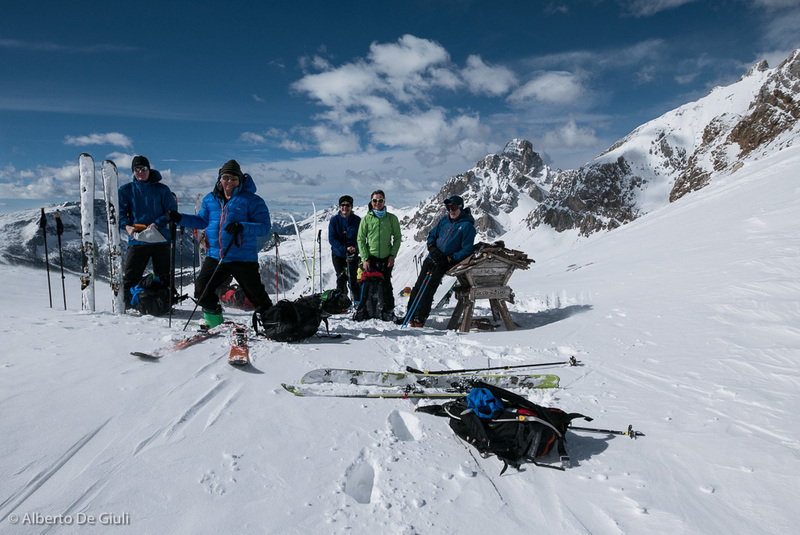 As I met the group in Cortina d’Ampezzo, before moving to San Martino di Castrozza for the night, we warmed up our legs around Cadini Misurina, Forcella della Neve is a nice and easy daytrip and the good powder snow on the downhill made us smile and gave us hope for the following days. 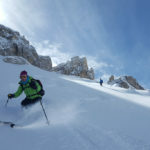 Monte Mulaz ski traverse, Pale di San Martino. 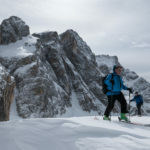 The first day of our Haute Route went for the traverse of Monte Mulaz, a classic and beautiful skitouring day around Pale di San Martino that should not be underestimated expecially after a snowfall, even more when a strong wind from the north starts blowing up in the mountains. 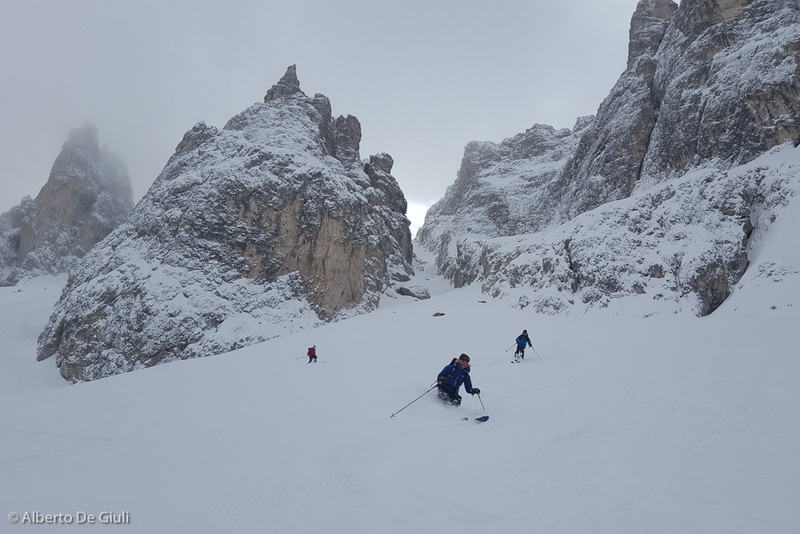 After a nice descent on powder snow from Baita Segantini, we started skinning up the slope towards the Passo del Mulaz, couple of steeper section needed to be well evaluated but we got up safely. 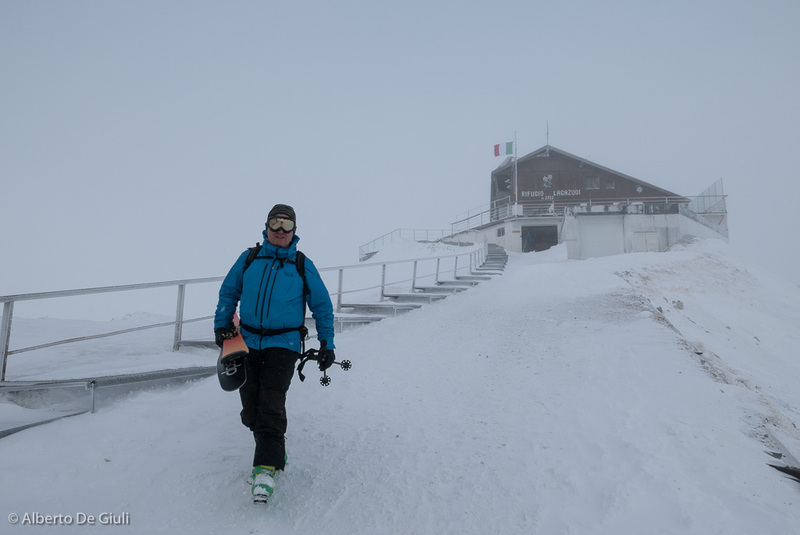 The strong wind welcomed us only on top of Passo del Mulaz, but it looked like it didn’t affect the snow quality and stability down the north side. 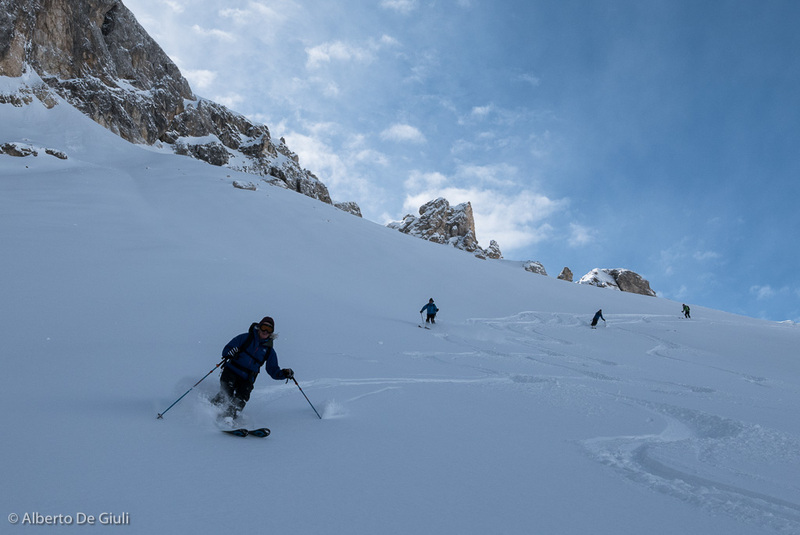 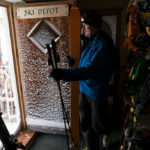 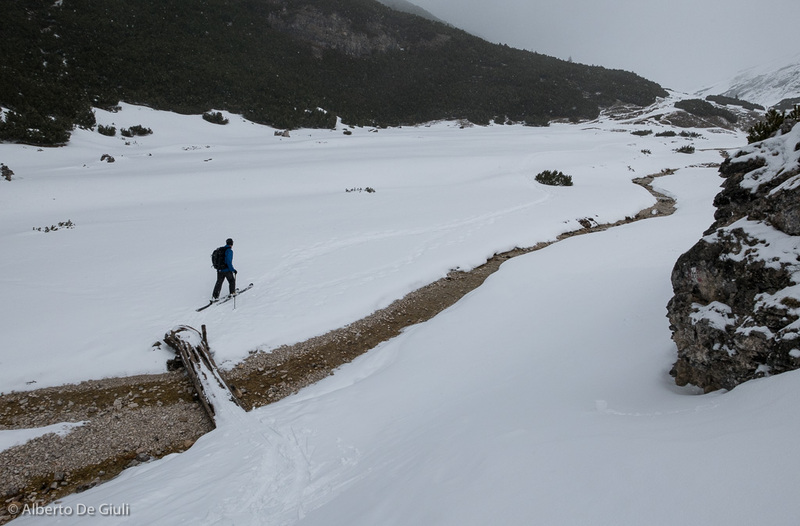 The descent down to Molino was more than exciting, great powder snow, soft and fast top to bottom all to ourselves till the end of the mule track that leads to the lifts of the ski resorts. 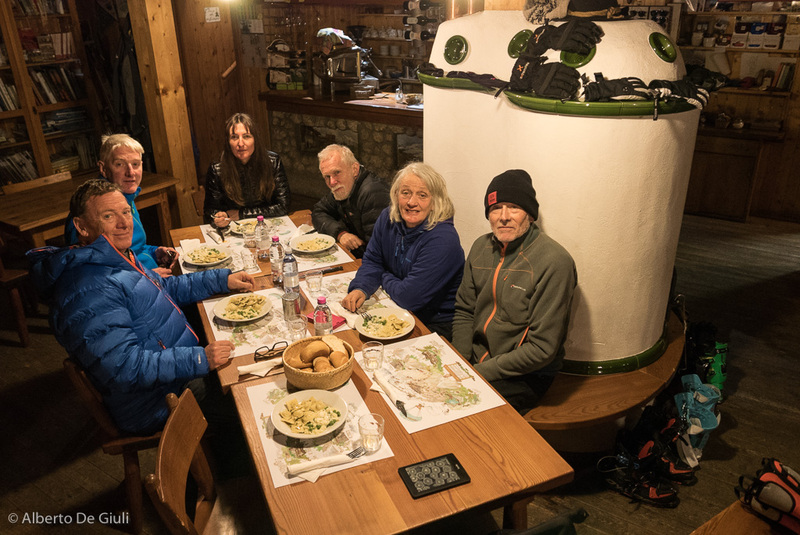 We spent the night at the Rifugio Fuciade, very well known for its hospitality and tremendous cuisine. 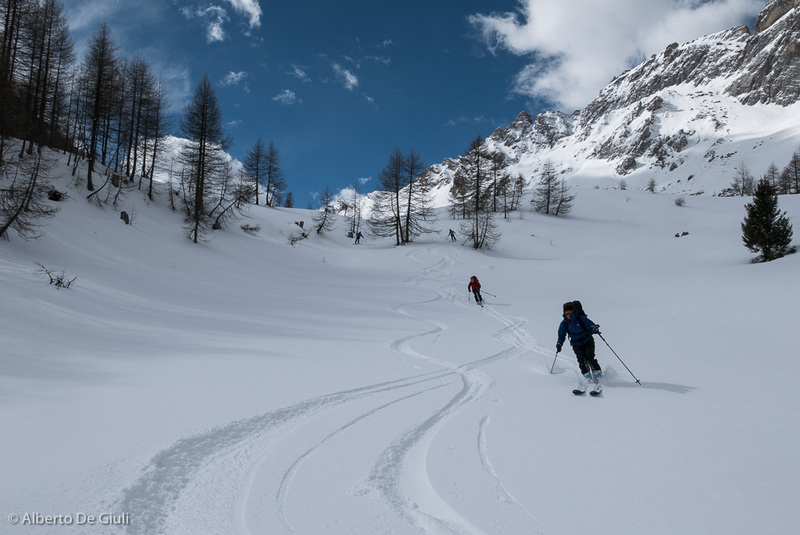 The bad part came during the night as a very strong wind started to blow with no stop… The traverse from Fuciade Malga Ciapela across Forca Rossa was still fun, the snow was still pretty good under the treeline and gave us some nice turns. 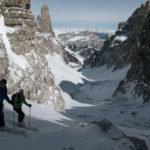 Forca Rossa ski traverse, San Pellegrino. 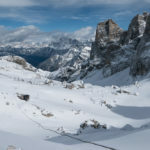 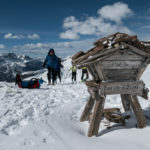 We got down to Malga Ciapela on skis and the atmosphere was just unreally silent, the Marmolada cable car was closed due to the gusts of wind, and we had no energy left to skin up to Rifugio Pian dei Fiacconi for the night. 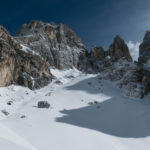 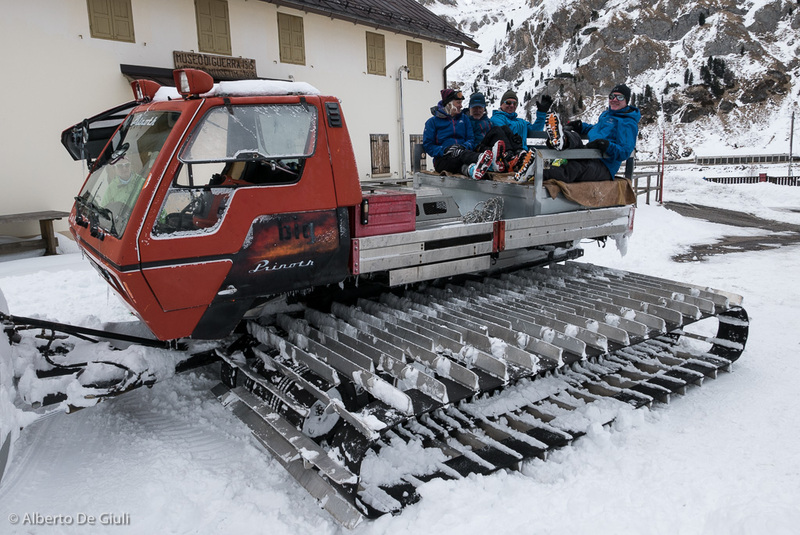 Guido, a good friend and owner of this beautiful mountain hut under the Marmolada (tallest peak in the Dolomites), solved the situation, giving us a ride with the snowmobile. 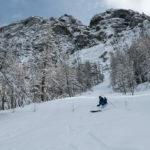 Thanks again buddy! 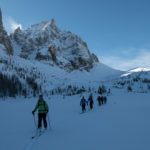 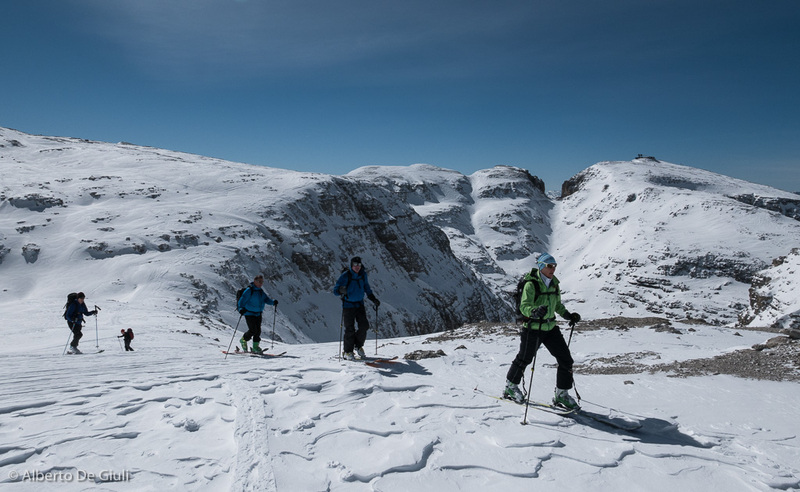 The third day was dedicated to traverse of the Sella massif, very few skiers had already skied down the Val de Mesdì, we didn’t know what happened after the wind though, we had to go and check it out ourselves. 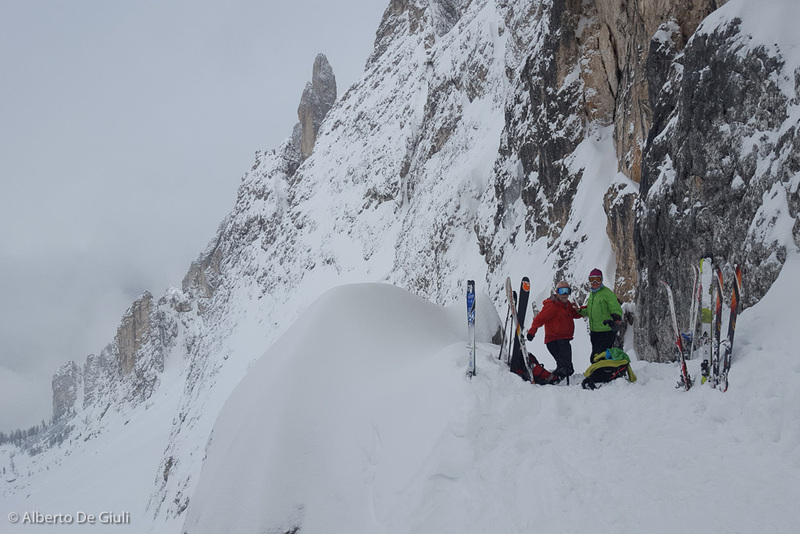 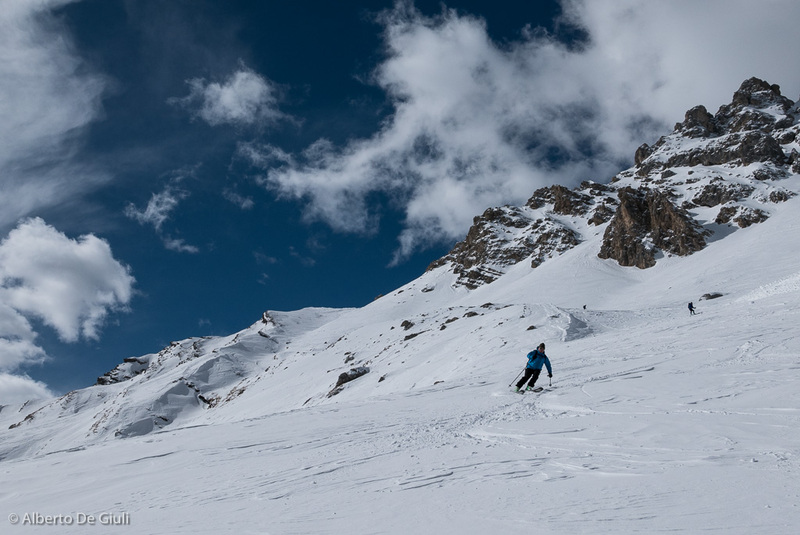 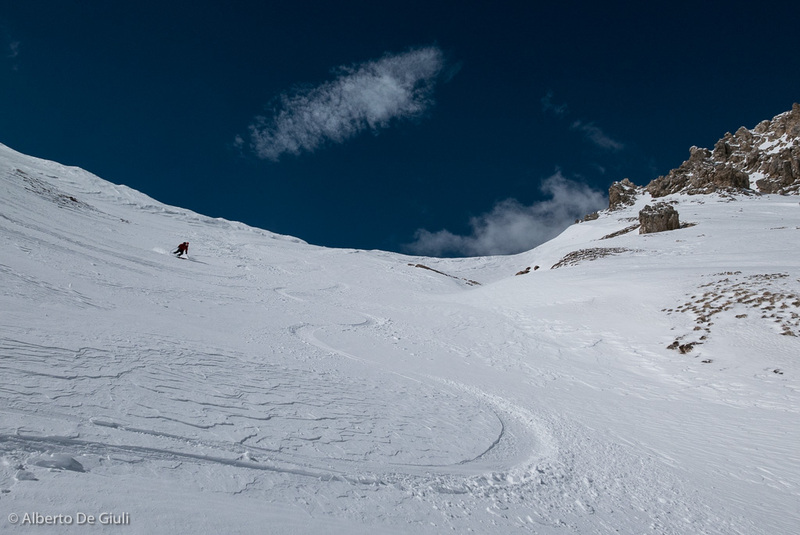 It was my first Val Mesdì of the season, and the conditions we found were more than good, the exit couloir was in good conditions despite the lack of snow. 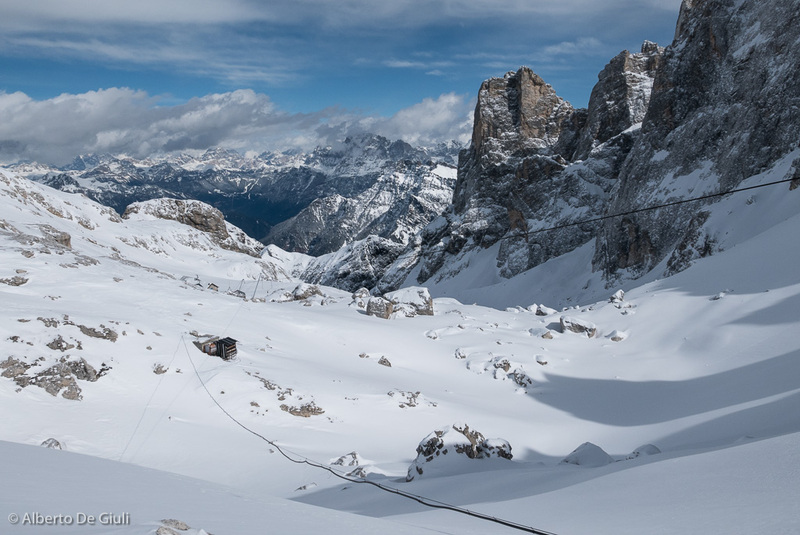 In the afternoon we reached the Rifugio Lagazuoi, one of the most beautiful mountain huts and with the highest sauna in the Dolomites. 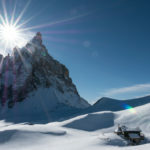 This is what I call “a luxury”. 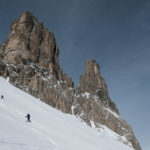 Sella Massif ski traverse. 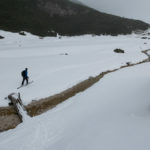 Val Mesdì. 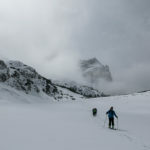 Unfortunately the bad weather came in for the last two days, we traversed from Lagazuoi to Senes across the Col Locia, Rifugio Fanes and Pederù on a gloomy day and it got worse in the afternoon when we had to skin up to Rifugio Sennes on a pouring rain that turned into heavy snow once we got over 2000 meters. 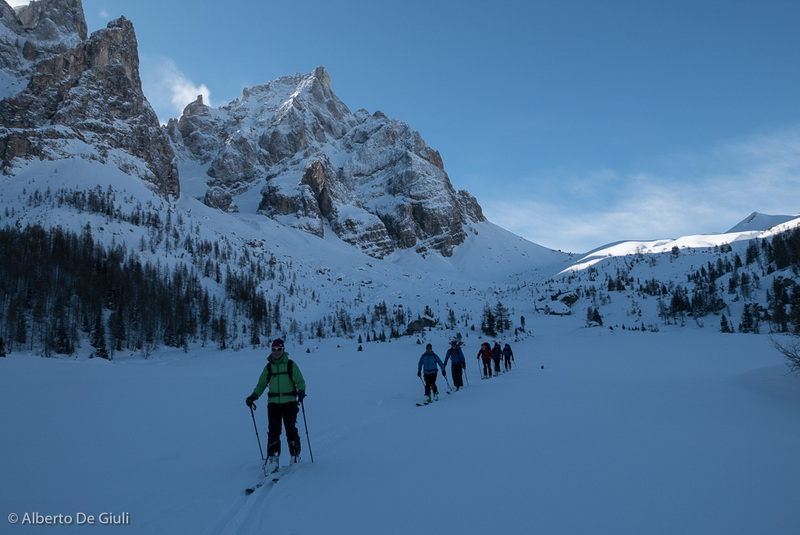 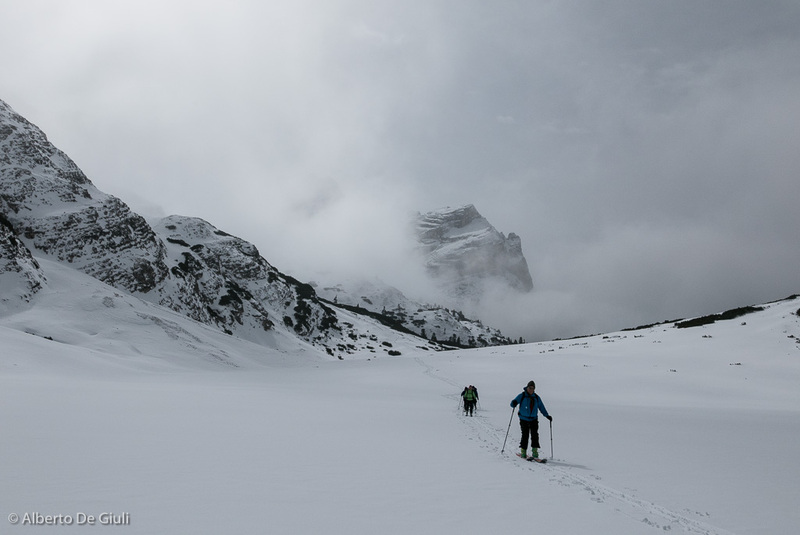 We were supposed to ski down to Lake Braies on the last day, as we reached Forcella Riciogogn we decided not to ski down the back side, we saw very little snow down the north side and some tricky snowslabs that would have compromised the safety of the group. 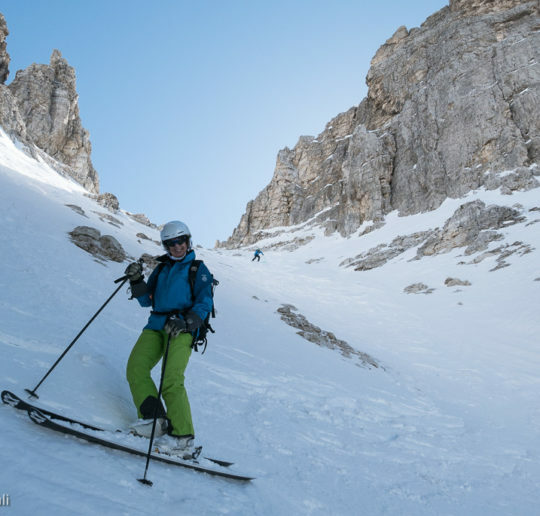 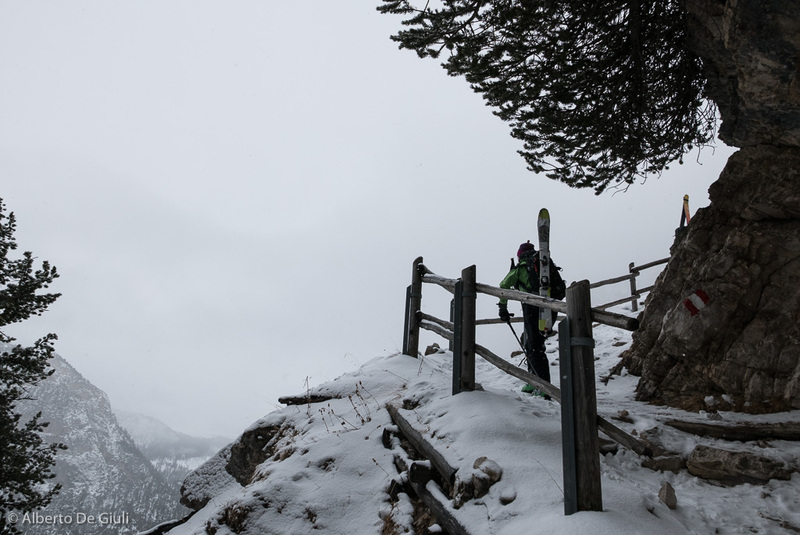 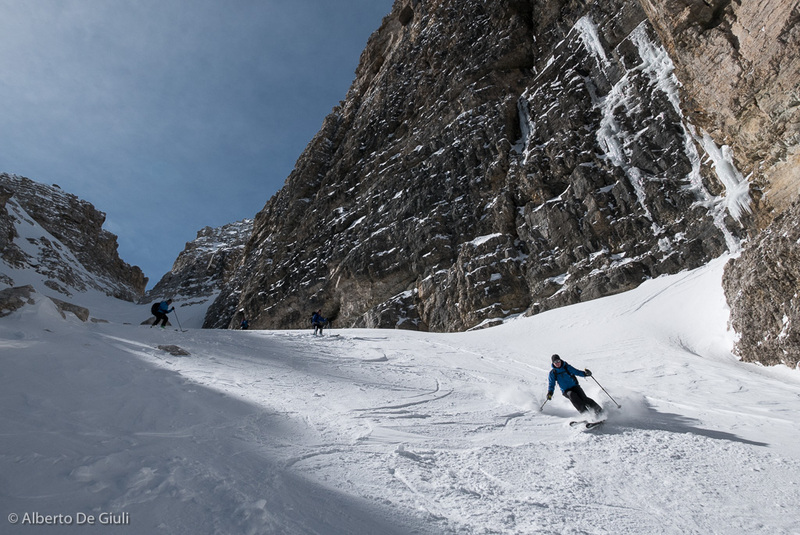 So we got the chance to make some good turns from Munt de Sennes and ski down to Ra Stua, and kept further towards Cortina d’Ampezzo. 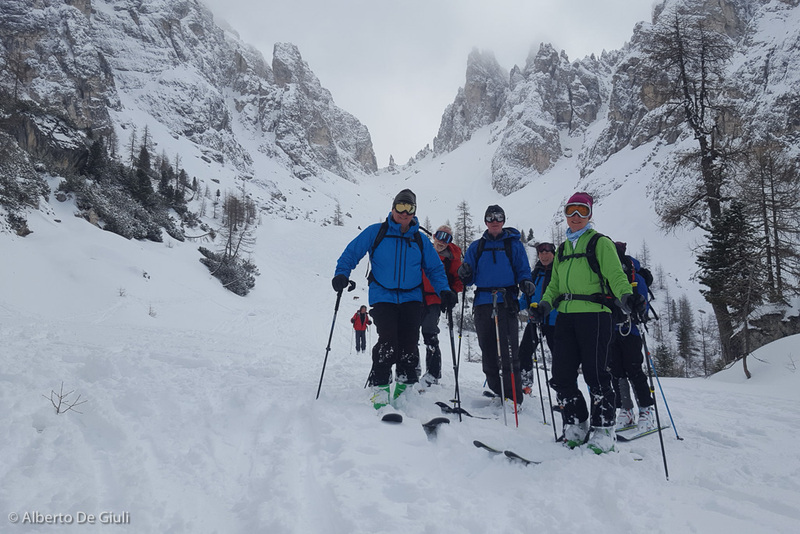 In the end we got 4 beautiful days out of 6, the group showed great skills and they did great throughout the week, despite somebody is close to be 70 years old. 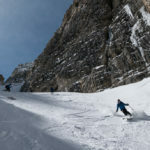 Way to go guys! 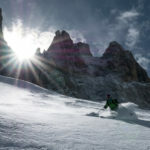 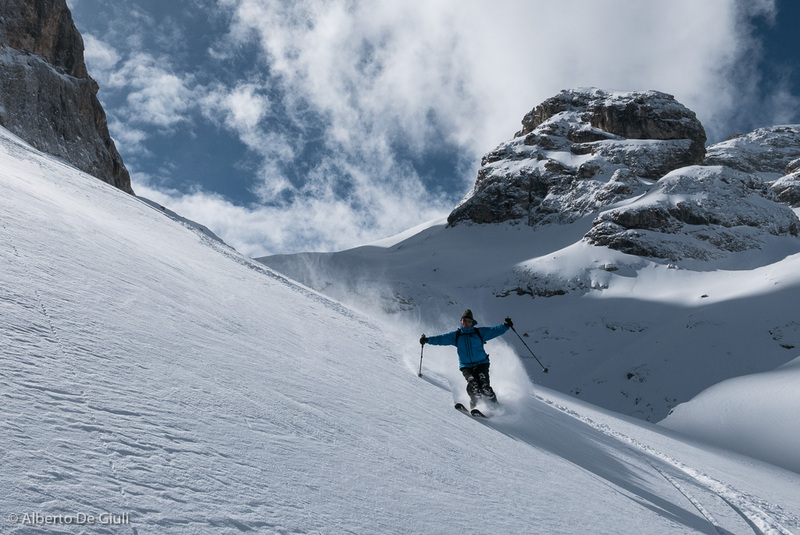 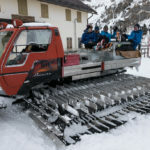 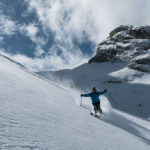 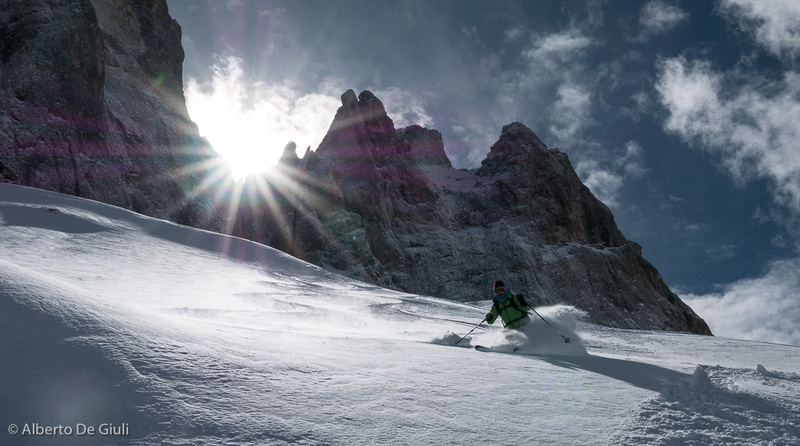 Skitour to Forcella della Neve, Cadini di Misurina. 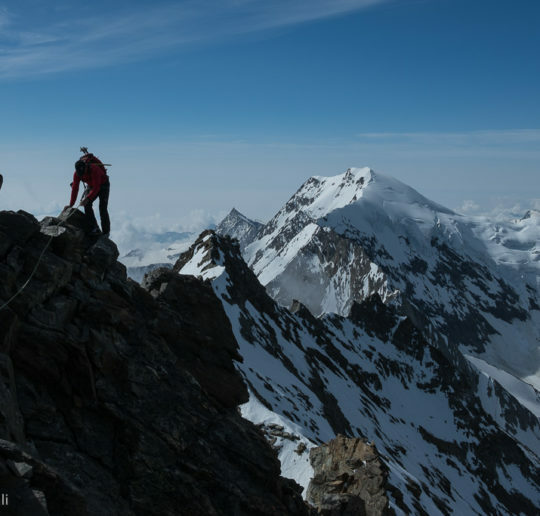 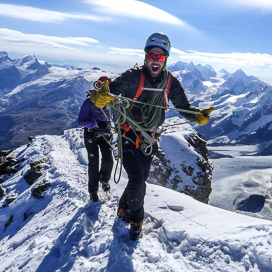 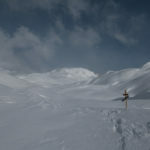 Monte Mulaz ski traverse. 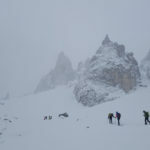 Pale di San Martino. 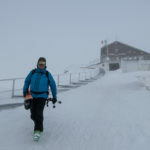 Ready to get up to Rifugio Pian dei Fiacconi. 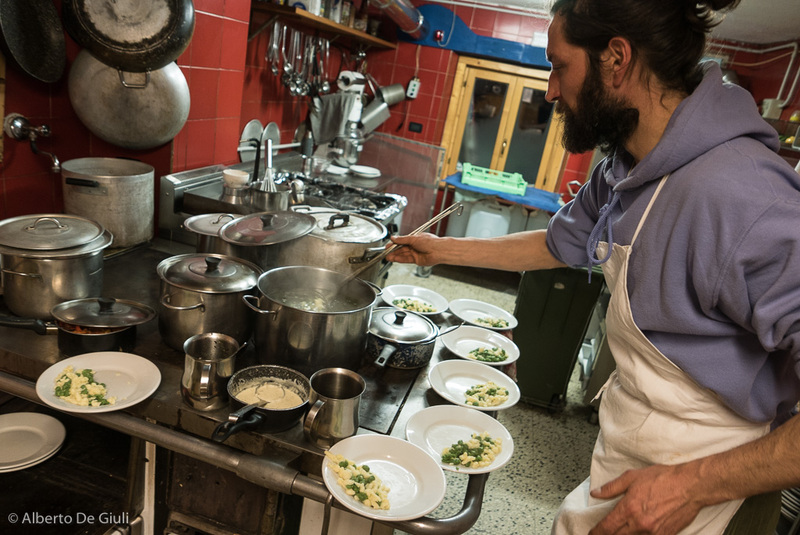 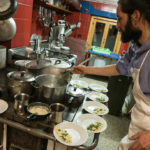 Guido, owner and chef tonight at Rifugio Pian dei Fiacconi. 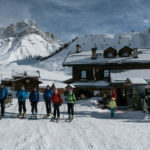 At the Rifugio Pian dei Fiacconi, Marmolada. 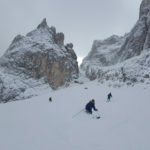 Sella Massif ski traverse. 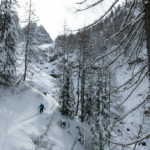 Val de Mesdì. 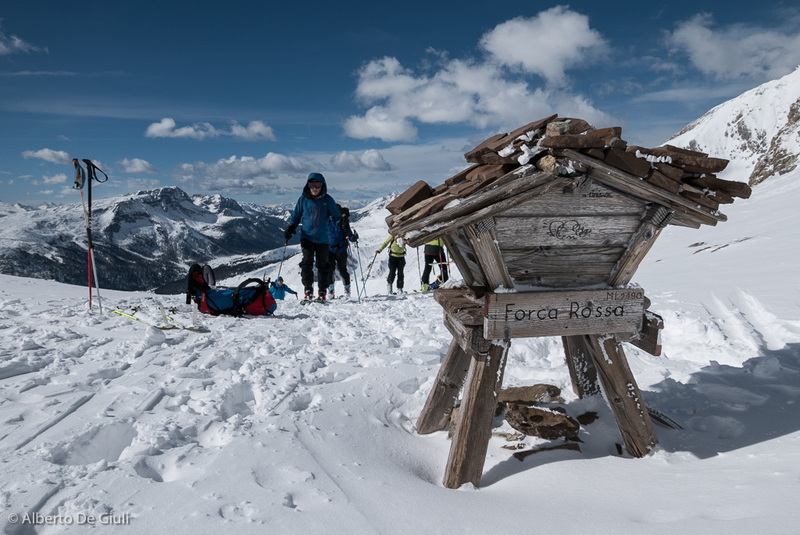 At the Forcella Riciogogn, Sennes.